The Hays Area Chamber of Commerce ribbon cutting ceremony for the new Robbins Banking Institute was held on Friday, August 25, 2017 in McCartney Hall. Dr. Mark Bannister, Dean of the College of Business and Entrepreneurship, gave a welcome to the large crowd of supporters for the institute, and introduced Alan Deines, the inaugural director for the Robbins Banking Institute. Deines thanked the supporters that have provided funding and shared his vision for the institute. Bannister then introduced W.R. Robbins, who along with his wife, Yvonne, provided the initial funding to launch the Robbins Banking Institute at Fort Hays State University. Andy Tompkins, Interim FHSU President, also spoke to the crowd and thanked W.R. and Yvonne Robbins for their generous gift to FHSU. 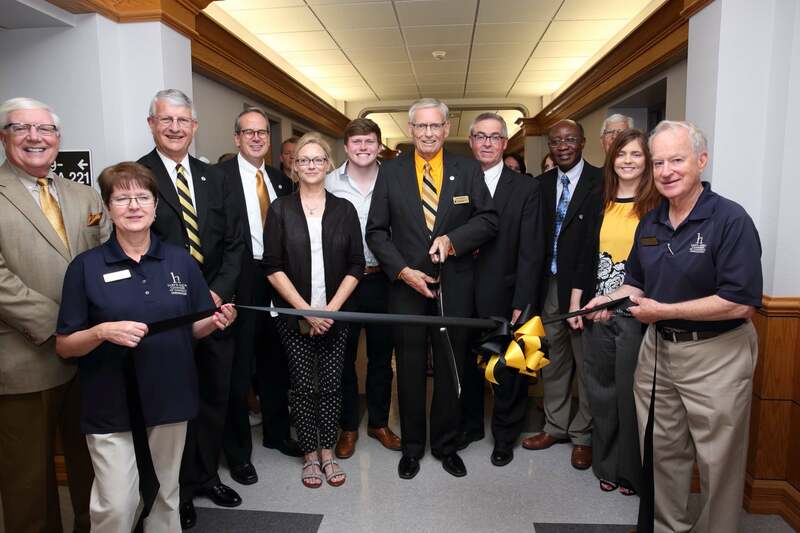 The Hays Area Chamber of Commerce then conducted the official ribbon cutting ceremony and everyone was invited to walk through the offices for the new Robbins Banking Institute in McCartney Hall 221.